TuningFork is an online, scriptable data visualization and analysis tool that supports the development and continuous monitoring of real-time systems. While TuningFork was originally designed and tested for use with a particular real-time Java Virtual Machine, the architecture has been designed from the ground up for extensibility by leveraging the Eclipse plug-in architecture. This allows different client programs to design custom data formats, new visualization and analysis components, and new export formats. 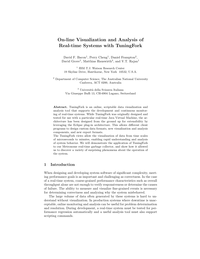 The TuningFork views allow the visualization of data from time scales of microseconds to minutes, enabling rapid understanding and analysis of system behavior. We will demonstrate the application of TuningFork to our Metronome real-time garbage collector, and show how it allowed us to discover a variety of surprising phenomena about the operation of the system.